The up side to my job is that I see very interesting things every time I go out...I kind of feel like I'm on Mulberry Street with Dr Seuss. Lunched with a girlfriend and loaded up on my favorite veggies...and a teeny bit of mac n cheese. Can't be good all the time, right? Last night, following a somewhat far away basketball game, there was chicken cacciatore, a loaf of bread and a selection of heaven in little white boxes. My weakness...See's candy. 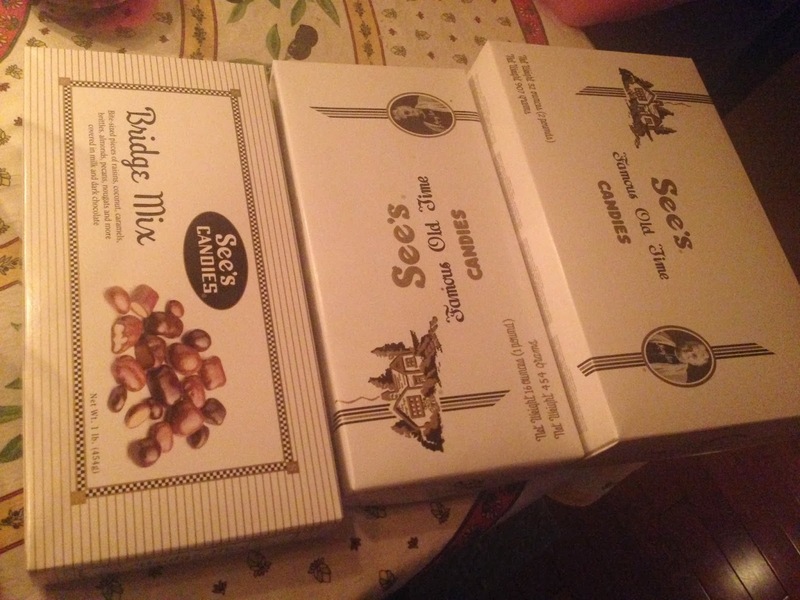 Best chocolates ever. My new favorite? Bridge mix. This morning I have a work meeting and then need to drive up to the main office in LA. It's kind of cloudy and misty and overcast...the perfect day for staying inside all day and drinking tea. At least I'll get the tea part. Still not sure what is for supper tonight. We're all home...I'll have to see what strikes my fancy at Costco later.